Hope you are doing well and feeling refreshed after the weekend. I coloured the image with Prismacolor pencils but this time I didn’t use the odorless solvent. I just used the pencils on their own as I wanted a bolder effect to bring out the dark and nocturnal characteristics that surround the vigilante. If you have a look at the digi you might also notice that the face appears wider than the one in my coloured version (in reality it is not!). That is done on purpose to allow for heavy shadows around the face since the hood casts a lot of dark shadow so you would need to use dark colours sparingly in this area. For my coloured version I used the no-line technique which eliminates the dark outline around the image. 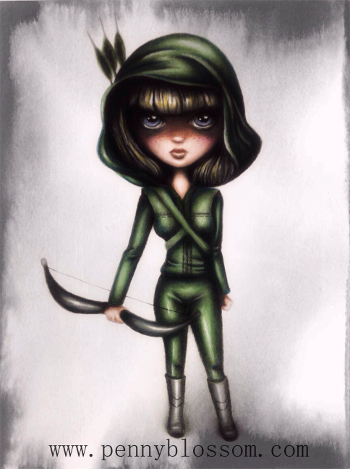 This entry was posted in Keeping in touch.... and tagged Arrow, Biskuttina, Card Making, Digistamps, Penny blossom, Prismacolor, Shadows, Vigilante on March 10, 2014 by Penny Blossom. Today I’ve got something different for you! 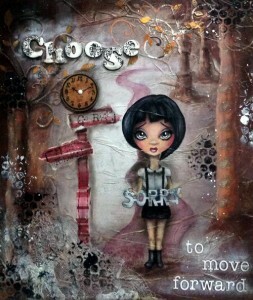 I’ve got a video showing a mixed media painting in progress where I used the ‘So Sorry’ image from the new range. I hope you like it 🙂 Feel free to contact me should you have any questions or feedback. This entry was posted in Keeping in touch.... and tagged Acrylic, Biskuttina, Mixed media, So sorry, Video on February 4, 2014 by Penny Blossom. 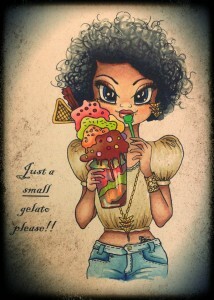 I want to say a big thanks for all your greetings and comments on the new Biskuttina range of digistamps. I enjoyed reading each and every comment!! Thanks a lot for your feedback 🙂 It means a lot to have all this caring support. I present to you another character from this new range!! It is called ‘So Sorry‘ which you can find in the shop here. Sorry – one of the hardest and most powerful words in our vocabulary. I really hope that during this coming new year we would find it a bit easier to use it and say it to the people we love and care about. Wishing you all a happy New Year and may you be blessed with health, peace, love and happiness! This entry was posted in Keeping in touch.... and tagged Biskuttina, New Year, Sorry on December 30, 2013 by Penny Blossom. I want to wish you a Merry Christmas and a Happy New Year!! I really wish you have an enjoyable festive season, including good times with family and friends and opportunities to make a difference in other people’s lives. 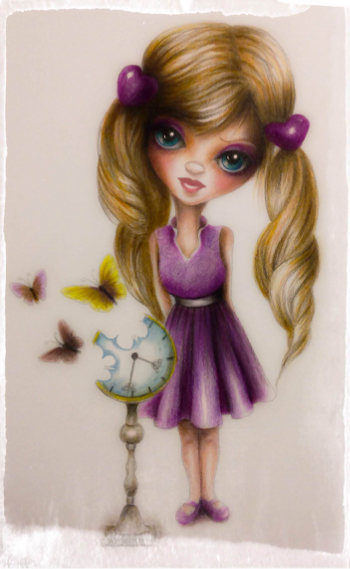 The other digistamp (‘A Little Gift’) is inspired from the beautiful, yet sad story of ‘The Little Match Girl‘. You can find it in the shop here. Sometimes in life you meet amazing people who are ready to give you a lot from the little they have! It is amazing how many big hearts are out there! And we can all learn from these people. We can all make a difference even if small! So many lives can be improved by sharing our ‘Little Gifts’. I hope you enjoy these drawings 🙂 Feel free to send me your feedback. Here I used the no-line technique which I really love because it gives a particular whimsical look to digis and I also feel that coloured images become more of a complete artwork. I coloured the characters with Prismacolor pencils together with an odourless solvent. I wish you all the very best and may you have a peaceful Christmas!! 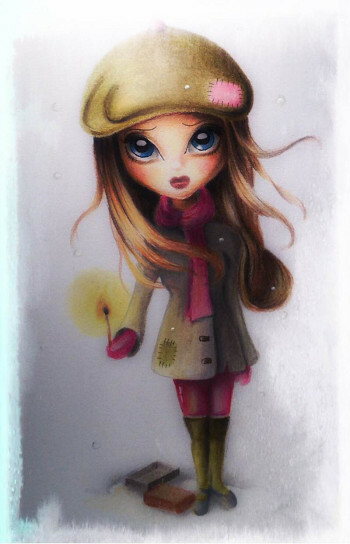 This entry was posted in Keeping in touch.... and tagged Biskuttina, Christmas, Freebie on December 24, 2013 by Penny Blossom. 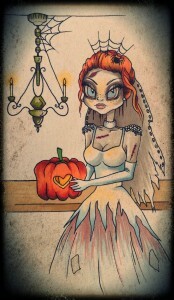 This entry was posted in Keeping in touch.... and tagged Bride, Challenge, Halloween, Scary, Spooky, Zombie on October 3, 2013 by Penny Blossom. A big hug to all of you 🙂 I’ve been away for some time and I truly missed you!! This entry was posted in Keeping in touch.... on October 1, 2013 by Penny Blossom. This entry was posted in Keeping in touch.... on August 7, 2013 by Penny Blossom. This entry was posted in Keeping in touch.... and tagged Beach, Fun, Gelato, Ice cream, Penny blossom, Short hair, Summer on July 25, 2013 by Penny Blossom. This entry was posted in Keeping in touch.... and tagged Challenge, Just Inspirational Challenges on July 23, 2013 by Penny Blossom.